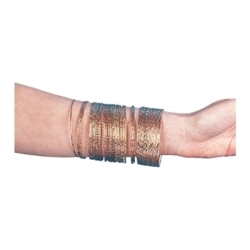 These bangle bracelets are made of metal and available in gold. Bracelets are perfect for gypsy costumes, fortune teller costumes, or just for fun costume jewelry. Each pack includes 25 bangle bracelets.